. : Optics & Photonics Focus :: Baffle the Bug! :. Magic lies in the beauty of a powerful illusion. This is what the latest achievements in optics seem to suggest; metamaterials are now able to optically turn one object into another. Puzzled by the zebra’s appearance? Experimental data of recent research supports the idea that zebras developed their striped coat to stave off horseflies. Evolution in black and white. The polarization pattern of the light reflected by a zebra’s coat looks very unattractive to bloodsucking horseflies, who are strongly polarotactic. Here we go again! That irritating buzz relentlessly approaching just will not let us fall into the arms of Morpheus. A mosquito is coming to feast at our expense. Luckily, we know how to fight back: nets, sprays or, if it comes to that, a clap of our hands will always provide a quick-and-dirty solution. In the wild, animals such as horses and zebras also need to defend themselves from similar parasites. For these animals evolution may have provided a helping hand. A group of Hungarian and Swedish researchers led by Gábor Horváth at Eötvös University (Budapest, Hungary) now suggest that zebra stripes have evolved to make the animal look unattractive to bloodsucking horseflies. At mating season, female horseflies feed on the blood of mammals in order to be able to lay eggs. How do they choose the host for their banquet? These insects, like many others, are guided by their eyes: not only can they see colors in a similar way as we do, but they can also perceive the polarization of light. Polarization is a characteristic of many waves, including light: think of a horizontally polarized wave as a long stretched rope fluttering right and left on a horizontal surface, and think of a vertically polarized wave as a rope undulating up and down in a vertical plane. "Horseflies are strongly attracted to horizontally polarized light, which means water for them. This behavior is called positive polarotaxis," Horváth points out. In fact, when unpolarized sunlight impinges on water bodies, the reflected light is almost perfectly horizontally polarized because the vertical component gets absorbed by the water. Horseflies use this information to find water "to drink, to cool their body, to find each other (males and females), to lay eggs, and to find host animals," he adds. "Thus, polarotaxis in both male and female horseflies is multifunctional, and very important for their survival." This discovery was accidentally made by the Hungarian researchers during a previous study . "In a Hungarian cemetery," Horváth reminisces, "I was studying the enigmatic attraction of dragonflies to shiny black gravestones. During the field experiments performed in that cemetery, I observed that my highly horizontally polarizing test surfaces attracted more than just polarotactic dragonflies — numerous horseflies were lured too." Seizing this knowledge, Horváth and colleagues decided to design a series of field experiments in order to determine how horseflies choose the animals from which to feed. The results of this study show that the color and the pattern of a horse’s coat can really make a difference. "We have quantitatively shown that dark horses attract 4-5 times more horseflies than white ones; zebra-striped horses, in their turn, attract a lot less horseflies than white horses," Horváth explains. On the one hand, a dark-coated horse is very attractive to blood-sucking polarotactic female horseflies, partly due to the high degree of linearly polarized light reflected by its coat. Reflection from a white coat, on the other hand, is mainly unpolarized. Furthermore, the black and white stripes in the zebra’s coat reflect very different polarizations of light in a way that effectively staves off horseflies. In Africa, where such bloodsucking flies are prevalent, delivering nasty bites and carrying diseases, a similar coat appears to represent a tremendous advantage. 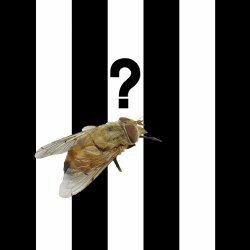 Could it then be that zebras have evolved their stripes as a defense mechanism against horseflies? "There are many other reasons that could have led to the evolution of zebra stripes: apparent size increase, visibility in poor light, the fact that moving stripes may dazzle predators, for camouflage or for social benefits, as a fitness indicator, for thermoregulation, or as protection against tsetse flies," Horváth is cautious to add. The truth is that "the reason for the evolution of a striped coat in zebras is still unknown. Our new, experimentally supported explanation should be placed in the mental arena of hypotheses on the reasons and evolutionary benefits of zebra stripes." G. Horváth, J. Majer, L. Horváth, I. Szivák & G. Kriska, Ventral polarization vision in tabanids: horseflies and deerflies (Diptera: Tabanidae) are attracted to horizontally polarized light, Naturwissenschaften 95, 1093-1100 (2008). Ádám Egri, Miklós Blahó, György Kriska, Róbert Farkas, Mónika Gyurkovszky, Susanne Åkesson & Gábor Horváth, Polarotactic tabanids find striped patterns with brightness and/or polarization modulation least attractive: an advantage of zebra stripes, The Journal of Experimental Biology (2012) 215, 736-745 (link).